Sheyda is a behind-the-scenes girl. She loves helping out in the kitchen of Doughlicious, the donut shop run by her best friend's family. And Sheyda loves designing stage sets while others performs in the spotlight. Then lights, camera . . . surprise! Tween heartthrob Cabe Sadler is filming his next movie in Doughlicious! Sheyda's outgoing BFF, Kiri, is sure this will lead to stardom, and perhaps a date with Cabe. But somehow it's Sheyda who gets picked for a small role in the film. To make matters worse, Cabe seems spoiled and rude. Too bad he's so cute. Can Sheyda overcome her stage fright, get to know the real Cabe, and find her own kind of stardom? 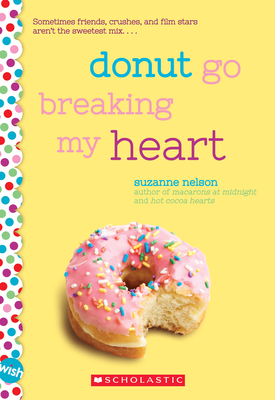 Suzanne Nelson has written several children's books, including Cake Pop Crush, Macarons at Midnight, Hot Cocoa Hearts, You're Bacon Me Crazy, Donut Go Breaking My Heart, and Serendipity's Footsteps. She lives with her family in Ridgefield, Connecticut, where she can also be found experimenting with all kinds of cooking. Learn more about Suzanne at www.suzannenelson.com.